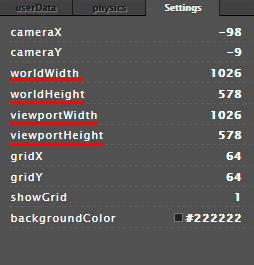 The world and viewport (camera) sizes of your game are controlled by clicking anywhere on the blank space of the grid. Select the ‘Settings’ panel and there you’ll see the parameters and their respective values. The differences between world and viewport sizes is simple – the game world is the are which can be displayed at any given time; game world has its boundaries and special methods. Viewport size, however, is the the area which is being displayed at the given moment, basically – it’s the camera.  Notice the dark-grey area on the grid – it’s the viewport. Here, the worldWidth is set to 500, while the viewportWidth to only 300px. Notice the character being able to walk out of view. And here we have both worldWidth and viewportWidth set to 500px.